Leading philanthropists have set up a $105 million fund to help end a disease that has plagued humanity since antiquity. Massive progress has been made by governments, donors and international organisations but more support is needed – so a new fund has been set up to help take elimination over the finish line. 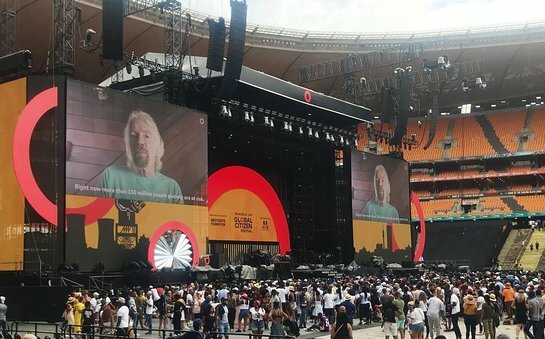 This latest step was announced by Richard Branson, via recorded video, at the star-studded Global Citizen concert in Johannesburg on Sunday (2 December), and on stage by Precious Mukelabai, a Zambian volunteer who distributes medication to protect people against trachoma. They represented funders from The Accelerate Trachoma Elimination Programme – led by the charity Sightsavers and including the Bill and Melinda Gates Foundation, Children’s Investment Fund Foundation (CIFF), The ELMA Foundation UK, and Virgin Unite. It builds on an announcement made by the UK government in April 2018 to boost elimination efforts through the Commonwealth 2018-2020 Fund. “This persistent disease blights the world’s poorest communities and traps people into lives of intense pain. It can turn eyelashes inwards so that with every blink they scrape against the ball of the eye, slowly turning people blind. Yet it is treatable and preventable.